Cast Iron Radiators from our Narrow Duchess, range of radiators are slightly thinner than our Princess Cast Iron Radiators which emerged around the same time. Believed to be originally manufcatured by the American Radiator Company circa 1890, its shallow depth is ideally suited for hallways and rooms where space is limited. Sometimes also known as the 'Peerless' radiator, this model is very much a modern day classic! 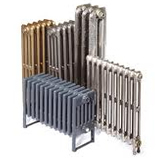 We have a strict quality control process to ensure that all cast iron radiators are of the highest quality. 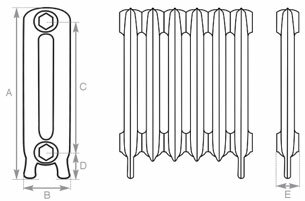 All cast iron radiators are delivered to you fully assembled and tested in accordance with the appropriate British standards. These cast iron radiators have a full 10 year guarantee to ensure peace of mind for years to come. As standard our cast iron radiators come finished in a primer, with the option to have them painted in any standard RAL colour or fully polished these can be finished to suit any property, be it a period or contemporary building. Delivery time is usually within 14 working days, please contact us if you have any urgent or special requirements as delivery times for cast iron radiators does vary depending upon the time of year. Period Valves - Select from our range of valves available here. Decorative Wall Stays / Pipe Shrouds - Select from our range available here. Delivery is made using a pallet service, the average delivery time is 7-14 working days subject to your choice of finish. To confirm our present delivery time please call us on 01723 321 333. We also have access to the beautiful English Heritage range of paints from Little Greene. 'Standard Antiquing' is black applied to any undercoat - usually a light colour like French Grey. More advanced Antiquing options can be found at ourAntiqued Cast Iron Radiators page which are priced individually.